Over the last 36 months, crews removed the brick façade of Crosland Tower, built in 1968 to house a rapidly growing collection of books. Originally, the building was meant to keep out sunlight harmful to the books, housing stacks on seven-foot high, reinforced floors. 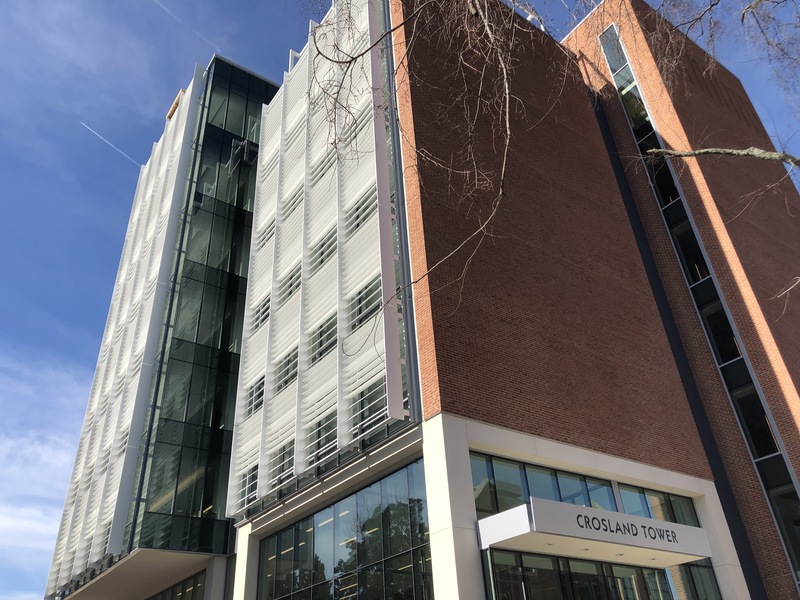 In its new iteration, Crosland Tower boasts loads of natural light and soaring, multi-floor atriums mirroring the midcentury modern architecture of Price Gilbert Memorial Library, now under renovation until 2020. When complete, both buildings will more than double seating capacity while cutting energy consumption by nearly 60 percent. The opening follows a complete overhaul of the Library’s collections and business model. In 2016, nearly all of the million-volume physical collection was moved into preservation-quality storage at the Library Service Center, a $26-million facility built through a public-private partnership with Emory University. Students and faculty now request materials online for delivery the next day. The Library has also adopted a number of concepts from outside of higher education, including supply-chain logistics and customer-focused retail models, in its commitment to research and learning excellence.